Belle cabine w / accès à la forêt nationale et Snowbowl Ski Resort. Situé sur 5 acres, cette propriété offre un cadre serein pour profiter de l'air frais de la montagne et des étoiles brillantes. La maison dispose de quatre chambres dans la maison principale et un appartement d'hôtes dans la structure adjacente. Deux familles pourraient facilement partager un logement. Il y a une salle de loisirs à l'étage avec une table de billard et des meubles qui peuvent être utilisés comme lits supplémentaires si nécessaire. Cette maison a été construite avec la famille à l'esprit et est le rendez-vous a-way parfait pour ceux qui recherchent espace pour se détendre. Mots-clés: Belle maison avec beaucoup d'espace. Aussi une maison d'hôtes avec une chambre à l'étage Rec. 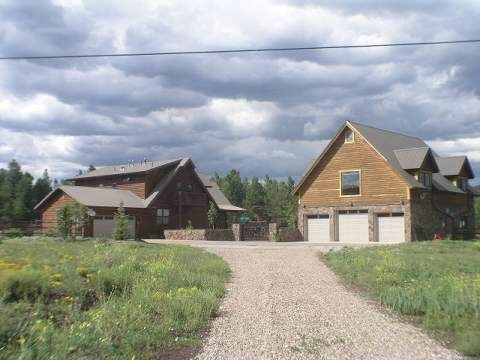 Beautiful home and guest house next to forest land and near skiing. Home was great with hot tub, upgraded kitchen, and a awesome mountain views. Spacious home with wood burning fire place and large deck. However the kitchen range was more than able to make up for it. Great property. Great accommodations in a beautiful setting. The house was perfect for our group (two families with young children). Plenty of room for the kids to play inside and outside, and the setting (abutting a forest preserve) couldn’t be nicer. Would highly recommend this property. Perfect escape with huge fenced yard. Very relaxing. What a wonderful family weekend this home and it's lovely host Heather provided. Everything was just perfect, we settled in and felt instantly at "Home". The Guest house is a great addition as well as the downstairs bedroom in the main house that was perfect for my elderly parents. We will certainly rent this home again! We stayed in March with a family of 6 for spring break. The home is about 15 minutes north of Flagstaff so we used it as a base for day trips to the Grand Canyon, Sedona and Page (Antelope Canyon, Horseshoe Bend) - all I'd highly recommend. Close enough for easy trips into Flagstaff for dinners. The home is very private, on a big lot. Beautiful, very cozy, lived in home. Great updated kitchen and outdoor space with 8 person hot tub, great grill we used several nights. We spent a lot of evening time in the rec room above the garage playing pool. One of the bedrooms is in the separate house, so didn't work for our family (our kids were too young to be comfortable there) but there was a nice air mattress we used. Definitely will stay there again if we're back in the area! We always come back to this property.